Pamela Gladding’s timeless paintings are always popular choices. Her traditional style and exquisite floral repertoire make her motifs perfect for open edition prints. 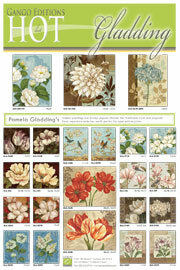 Visit www.gangoeditions.com to see the full selection of Gladding works or download our new Pamela Gladding Hot List today. Keep coming back to the Design Lab for more hot themes! Hot Lists, new releases, and special promotions can now be found on our facebook page too!